KhelChamp Fantasy League Super Offer – Hello Friends, This IPL season is full of Real Cash. 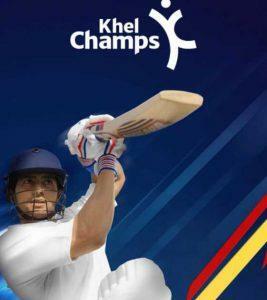 Now Khelchamp is a New fantasy app with low competition & higher payout. 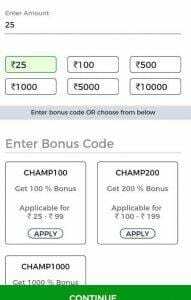 You can Win Upto Rs.100 for joining just a league of Rs.1. This app is similar to Dream11 & Halaplay or Other Fantasy Cricket Apps but it has low competitions & Lower League Price. You can earn Real money for Just Investing Rs.1 onward. You can start depositing to wallet starting at Rs.25 Grab this offer, fast Guys. This May expire anytime. 2. Now an APK will Start Downloading, Install the APP & do as shown in the screenshot. 3. Now click on have Referral code & Signup from the bottom left side. 5. You may need to turn your GPS on & click on Submit done! 6. Now You can see the upcoming matches on the panel. 8. You can see the contest here. 10. Start Your first deposit & Win real money With Fantasy cricket. 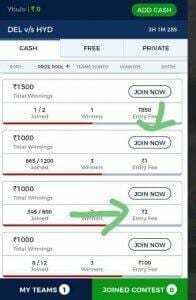 You can Join League of Rs.1 initially & win big. 1. When You Create Team, Visit Menu & Click On Add Cash. 2. Add any amount & Get 1000% Bonus cash that you can use full on leagues. 1. First of all click on Three lines from bottom. 2. Now click on Add cash button from the top. 3. Now enter the amount that you want to add. 4. the Minimum amount should be Rs.25, You can see bonus codes below apply them. 5. Add money using your payment method & cashback will be credited instantly. 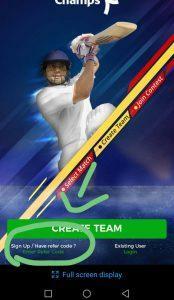 You can Start Playing Real Fantasy Cricket by Just downloading App & investing an initial amount of Rs.25. 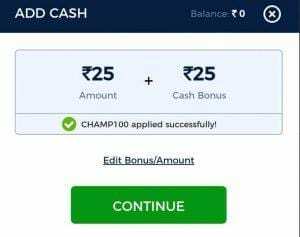 You can earn more real cash by this offer & valid till IPL only so grab it fast. if you need help in Team Predictions you can comment below.